The gathering of the Hordes. Hordes of Yore came to life as a then unnamed project in 2002, risen from the ashes of several other projects lost in the inexorable sands of time, most notably Walpurgis Nacht. The two minds behind the creation of this endeavour were Tiago Martins and Hélder Marciano, aiming to attain a fresh and innovative perspective on the Extreme Metal world of nowadays. From those early times on, it has been a constant yet relentless uphill struggle. The previous Walpurgis Nacht split left behind recorded songs which had no way to be promoted and a lingering uncertainty about the future of the band. Regardless, driven by their everlasting love for music, a decision was made to move on. Thus, new songs began to be weaved and, with these new pieces, arose the perception that the new musical and lyrical concepts would have to differ tremendously from those pursued in the past. By exploring their own personal tastes in music, literature and cinema, Hélder and Tiago came to the conclusion that both shared a deep and strong admiration for History, and all the tales and yearning that the study and reflection about the past ensues. At the turn of 2004, a decision was made to evolve and record a full-length album, despite the numerous line-up problems that have seemingly plagued the band since their earlier days. However, permanent members were found in both Bruno Vaz, who had joined in on the guitars in 2003, and André L. Vasconcelos, who took charge of the vocals and the acoustic arsenal of folk instruments. 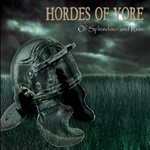 The debut album of Hordes of Yore, tentatively entitled “Of Splendour and Ruin”, is expected to be unleashed sometime in the first trimester of 2005, being wholly financed and published by the band itself. As the name implies, it will be a conceptual album about the ascension and decay of the once mighty Roman Empire. Musically it shall spawn a brutal maelstrom, allying harsh extreme metal ferocity to some unorthodox instrumentation, with a lyrical complexity to match. ... what lays ahead, only the sands of time shall unveil. Tiago Martins – bass, lyrical concept. Hélder Marciano – Rhythm and lead guitars, acoustic guitars and singing vocals. Bruno Vaz – Rhythm and lead guitars. André L. Vasconcelos – Vocals, Mandolin, Mouth Harp, Didgeridoo and Ethnic Percussion. Tiago "Rato" Martins - Synths. Tânia Vaz - Female vocals.